Elephant is the fourth studio album by American rock duo The White Stripes. It was released on April 1, 2003, through V2, XL, and Third Man. The album garnered near unanimous critical acclaim and commercial success, earning a nomination for Album of the Year and a win for Best Alternative Music Album at the 46th Grammy Awards in 2004, peaking at number six in the US Billboard charts and topping the UK album charts. In later years the album has often been cited as the White Stripes' best work and one of the best albums of the 2000s; Rolling Stone magazine ranked it 390th on its list of "The 500 Greatest Albums of All Time" and later, the fifth-best of the decade. Third Man Records released a limited edition red, black and white vinyl reissue of Elephant on April 20, 2013, in celebration of the album's 10-year anniversary, as a Record Store Day exclusive. Elephant is the White Stripes' fourth full album and the second to be released by V2 Records. In this album, the White Stripes attempted to achieve the idea of "Back to Basics" as well as encouraging other rockers to try the same way. Including the song "I Just Don't Know What to Do With Myself" (a Burt Bacharach cover) in their repertoire was Meg's idea, and the band had begun to cover the song live. It was recorded over two weeks in April 2002 in London's Toe Rag Studios except for the songs "Well It's True That We Love One Another," which was recorded at Toe Rag in November 2001, and "I Just Don't Know What to Do With Myself", which was recorded at the BBC's Maida Vale Studios. Jack White produced the album with antiquated equipment, including an eight-track tape machine and pre-1960s recording gear. As stated in the liner notes, White deliberately refrained from using computers during Elephant's writing, recording, or production. The White Stripes set their own rules while they were recording this album: ten days in a non modern studio. They chose to record in Liam Watson's modest Toe Rag studio in Hackney, London, England. The liner notes included the disclaimer, "No computers were used during the writing, recording, mixing, or mastering of this record," and none of the recording equipment was more recent than 1963. The special edition 2013 Record Store Day, and August 2013 180-gram black vinyl reissues were pressed at United Record Pressing in Nashville, TN. The album's themes revolve around the idea of the "death of the sweetheart" in American culture. In this album, the White Stripes expanded their style more than ever before, such as using a bass line - their rarity, piling with lead and rhythm guitar. Moreover, during the album Jack played guitar or keyboard to fill out the sound, but to the audience it still felt raw. Like other White Stripes records, the cover art and liner notes are exclusively in red, white, and black, and there is a song that contains the word "little" in the title ("Little Acorns"). The album has been released with at least six different versions of the front cover—different covers for the CD and LP editions in the US, the UK and elsewhere. 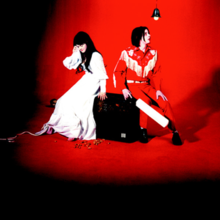 To give an example, on the US CD edition Meg White is sitting on the left of a circus travel trunk and Jack is sitting on the right holding a cricket bat over the ground, while on the UK CD edition the cricket bat touches the ground and the image is mirrored so that their positions on the amplifier are reversed. The UK vinyl album cover is the same as the US CD but differs in that the color hues are much darker. The cryptic symbolism of the album art includes a skull sitting on the floor in the background, as well as peanuts and peanut shells in the foreground, and on the circus travel trunk appears the mark "III," Jack White's signature. Jack White is also displaying a mano cornuta and looking at a light bulb intensely, while Meg White is barefoot and appears to be crying, with a rope tied around her ankle and leading out of frame. Both have small white ribbons tied to their fingers. On the reverse side of the U.S. edition, all of the number "3"s are in red (disregarding the authorization notes at the bottom). The Record Store Day 2013 vinyl and August 2013 180-gram black vinyl reissues have Meg wearing a black dress instead of the usual white dress; the only other release with Meg wearing the black dress was on the V2 advanced copy back in 2003. The advanced copy was on red and white vinyl, while the RSD copy has red, black and white colored vinyl in 2013. In an interview with Q Magazine in 2007, Jack White said, "If you study the picture carefully, Meg and I are elephant ears in a head-on elephant. But it's a side view of an elephant, too, with the tusks leading off either side." He went on to say, "I wanted people to be staring at this album cover and then maybe two years later, having stared at it for the 500th time, to say, 'Hey, it's an elephant!'" ) upon release, but later admitted that he had underrated it, and gave it a new grade of A-. However, this album won big awards in just the first year: three MTV Video Music Awards, two summer dates with the Rolling Stones, and a sold-out gig at the venerable Radio City Music Awards. According to Rolling Stone magazine, White matches the energy from his earlier albums and is even thought to "[exceed] the plantation holler of 2000's De Stijl and 2001's White Blood Cells with blues that both pop and bleed". The album debuted at number one in the United Kingdom and reached number six on the Billboard 200 in the US. The album won Grammys for Best Alternative Album and Best Rock Song ("Seven Nation Army"). In 2003, the album was ranked number 390 on Rolling Stone magazine's list of the 500 greatest albums of all time. It was also placed thirty-ninth in Channel 4's list of the 100 Greatest Albums of all time. In December 2003, NME made it their Album of the Year. In 2011, Rolling Stone called Elephant the 5th best album of the decade, and Seven Nation Army the 6th best song of the decade. The album was also included in the book 1001 Albums You Must Hear Before You Die. All tracks written by Jack White, except where noted. Meg White – drums, backing vocals, lead vocals and organ on "In the Cold, Cold Night", co-lead vocals on "Well It's True That We Love One Another"
Mort Crim – speech on "Little Acorns"
Holly Golightly – co-lead vocals on "Well It's True That We Love One Another"
^ Whitman, Andy; et al. (January 29, 2018). "The 50 Best Garage Rock Albums of All Time seven nation army". Paste. Retrieved March 24, 2018. ^ a b c Phares, Heather. "Elephant – The White Stripes". AllMusic. Retrieved September 24, 2011. ^ Kitty Empire (March 15, 2003). "They rock - like a beast". The Observer (via The Guardian). Retrieved March 24, 2018. ^ Leahey, Andrew. "The White Stripes > Biography" at AllMusic. Retrieved September 24, 2011. ^ McGovern, Kyle. "Jack White Stomps All Other Record Store Day Exclusives With 'Elephant' Reissue". Spin. Retrieved April 23, 2013. ^ Andrew Leahey. "The White Stripes - Discography - AllMusic". AllMusic. ^ a b Pareles, Jon. "White Stripe: Same Old Colors". The New York Times. Retrieved March 31, 2014. ^ Phipps, Keith (April 9, 2003). "The White Stripes", AVClub.com. Retrieved October 24, 2014. ^ a b c Various artists (November 1, 2007), "The White Stripes Elephant". The Mojo Collection—The Ultimate Music Companion (4th Edition). Canongate Books. ^ a b c Cameron, Keith (March 28, 2003), "The sweetheart deal". The Guardian. Retrieved December 12, 2014. ^ "White Stripes - Elephant - RSD Reissue - on press! - Facebook". facebook.com. ^ Lindgren, Hugo. "The Way We Live Now: Questions for the White Stripes". The New York Times. Retrieved April 1, 2014. ^ The White Stripes official website Archived September 26, 2007, at the Wayback Machine, index to album artwork including covers, page 1 of 3. Page retrieved June 21, 2007. ^ a b "Reviews for Elephant by The White Stripes". Metacritic. Retrieved November 11, 2013. ^ Brunner, Rob (March 31, 2003). "Elephant". Entertainment Weekly (703). ISSN 1049-0434. Retrieved September 24, 2011. ^ Petridis, Alexis (March 28, 2003). "The White Stripes: Elephant". The Guardian. London. ISSN 0261-3077. OCLC 60623878. Retrieved September 24, 2011. ^ Hilburn, Robert (March 30, 2003). "Sitting atop rock's new wave". Los Angeles Times. Retrieved November 26, 2015. ^ a b Mulvey, John (March 7, 2003). "White Stripes: Elephant". NME. Archived from the original on February 9, 2011. Retrieved November 26, 2015. ^ DiCrescenzo, Brent (April 1, 2003). "The White Stripes: Elephant". Pitchfork. Retrieved September 24, 2011. ^ "The White Stripes: Elephant". Q (201): 98. April 2003. ^ a b Fricke, David (March 25, 2003). "Elephant". Rolling Stone. ISSN 0035-791X. Retrieved September 24, 2011. ^ Klosterman, Chuck (May 2003). "White Hot". Spin. 19 (5): 107–08. ISSN 0886-3032. Retrieved September 24, 2011. ^ "The White Stripes: Elephant". Uncut (72): 94. May 2003. ^ Alves, Tim (April 4, 2003). The White Stripes: Elephant" PopMatters.com. Retrieved September 11, 2007. ^ "Expert Witness: Jack White/The White Stripes". social.entertainment.msn.com. Retrieved May 22, 2012. ^ Katchen, Andrew. "White Stripes Stay Pure On 'Elephant'". Billboard. Retrieved March 31, 2014. ^ "White Stripes Elephant Album Review". Rolling Stone. ^ "100 Best Albums of the 2000s". rollingstone.com. July 18, 2011. Retrieved June 24, 2016. ^ aCharts.us Elephant chart positions Retrieved on April 14, 2014. ^ a b "The White Stripes: Charts and Awards". Billboard. Retrieved January 17, 2008. ^ "The White Stripes - Elephant (Album)" (in Dutch). Retrieved April 14, 2014. ^ a b c French sales and certification FanOfMusic.Free.fr "Retrieved on November 3, 2007. ^ "Chartverfolgung / WHITE STRIPES,THE / Longplay" [Chart Tracking / WHITE STRIPES, THE / Long Play] (in German). musicline.de. Retrieved September 24, 2011. ^ "2003 Top 40 Official Albums Chart UK Archive 12th April 2003". Retrieved April 1, 2014. ^ Australia. "ARIA Charts — Accreditations — 2003 Albums". Australian Recording Industry Association. Archived from the original on January 25, 2012. Retrieved January 17, 2008. ^ Canada. "CRIA". Canadian Recording Industry Association. Archived from the original on March 25, 2010. Retrieved January 17, 2008. ^ "Dutch Certification (IFPI)". IFPI. Archived from the original on January 3, 2008. Retrieved January 17, 2008. ^ New Zealand. "RIANZ". Recording Industry Association of New Zealand. Archived from the original on June 21, 2007. Retrieved January 17, 2008. ^ Sweden. "IFPI". IFPI. Archived from the original on October 20, 2007. Retrieved January 17, 2008. ^ United Kingdom. "BPI". British Phonographic Industry. Archived from the original on December 30, 2007. Retrieved January 17, 2008. ^ Homewood, Ben (27 April 2017). "Jack White signs first ever global publishing deal with Universal Music Publishing Group". Music Week. Retrieved 10 June 2018. ^ United States. RIAA Archived February 28, 2007, at the Wayback Machine Recording Industry Association of America.